The conventional car industry is now in sharp decline across the world while consumer demand for zero or low emissions green cars is rising fast. The pseudo-freedom and autonomy offered by cars has largely become an accepted part of life for many in developed countries but is becoming less popular due to increased congestions. However,cars with internal combustion engines consume a lot of fuel and emit greenhouse gases. Some people are unhappy about promoting the use of cars, and prefer bikes and public transport. However, a large number of people now regard the convenience and freedom of car use as an essential part of their life. If you are going to drive a car, choose the "greenest" one you can. Inflate your tyres higher than the manufacturer's rating and keep them inflated. Under inflated tyres can increase your fuel consumption by 5% or more, and manufacturers understate tyre pressures in favour of ride comfort. Keep your car for five years or more. Buying a new car frequently requires more cars to be made, and every car represents a lot of "embodied energy" used to make it. Don't use your car unless you have to - take public transport or ride a bike instead. Don't buy it if you don't really need it! Consider whether an electric motorcycle or scooter would do instead. Consider whether a fuel efficient scooter would do instead. Buy the most fuel efficient car you can afford that suits your purpose. Lighter weight vehicles are typically more efficient. The following choices, ranked generally in order of overall "green-ness" are available now. Buy an electric car (list)). Some models can travel over 150km between recharges. If possible charge it with electricity from renewable sources (solar, wind etc). Convert a car to electric power. There are several Professional EV workshops operating in Australia. FireFly's recent lead acid battery innovations. All of the below vehicles produce some emissions. For more information see Comparison of Transport Fuels Report. Hybrid petrol/electic car. Hybrids generally use less fuel and produce fewer emissions than normal petrol cars. However, the greeness of pre-2003 Toyota Prius's is frequently disputed. Most all large manufacturers will be releasing Hybrids over the next few years. A Plug-in Hybrid is better because you can charge up your car without using the onboard combustion engine, perhaps even use renewable energy to put some green energy in the battery. Even plugging your car into your house is much better for the environment then using the onboard engine to charge the battery. Diesel car. Diesel engines are more efficient than petrol ones - some have fuel consumption figures as good as hybrids at around 5 litres per 100km. Some diesels can also use diesel biofuel made from plant oils. The most efficient small diesel car available in Australia in 2008 is the Hyundai i30 which uses 4.5l/100km. The Blade Electric Vehicle - an electric car conversion for new and used Hyundai Getz cars commenced production during 2008. 2012- The Toyota FT-EV Japanese car maker Toyota used the 2009 Detroit motor show to unveil the FT-EV, a concept car that previews a new battery-electric "urban commuter" vehicle set to go on sale globally in 2012. This electric car may cost around A$25,000 could be on sale in Australia by 2012. 2009- The F3e made by BYD AUTO in China is a integrates both IT technology and Auto technology of BYD. It combines world class rechargeable battery technology, excellent R&D technology of automobile core components and parts and complete vehicle manufacturing technology. This vehicle is not yet available in Australia. The GM Volt will be built in Detroit in 2011 - but there is no date for importation to Australia. The Ford Motor Company has a Project M to build a prototype of a totally electric, battery-powered car in just six months. When it was started summer 2008, the effort was considered a tall order by the small team of executives and engineers assigned to it. But Ford was feeling pressure from competitors, and decided it could not afford to fall behind in the rapidly expanding race to put electric cars in dealer showrooms. "Frankly, I think it's a gamble not to do it," said William Ford jnr, the company's executive chairman. "It's clear that society is headed down this road.". No Australian launch date is yet available. Over 250 Tesla Roadsters have been delivered. These are pure electric cars capable of very fast acceleration and over 350km range per charge. The Tesla Model S has just been announced. These have 500km range, a 45 minute quick charge feature and can seat 7 people with more cargo space than station wagons. Toyota is building the second-generation Toyota RAV4 EV. In 2011, 35 vehicles will be built for a demonstration program. Then expect the RAV4 EV to be in showrooms in 2012. This version is expected to have a range of 100 miles. Many people are starting to even build their own electric vehicles. In addition, there is a growing network of new and used electric vehicle dealers and conversion shops nationwide. an LPG conversion enables you to use cheaper LPG (liquid petroleum gas), but note that most LPG is a byproduct of oil refining, so when oil supplies dwindles the price of LGP will rise along with petrol and diesel. an CNG conversion enables you to use CNG (compressed natural gas), which is more abundant than crude oil reserves, but there are currently very few refuelling locations available in Australia, largely due to inadequate government policies to establish them. There are several active lobbyists attempting to change this. See Rosetta Moon for more information. There currently only two public CNG refueling station located in Melbourne. Currently there are no pre-converted CNG passengers vehicles being offered in Australia. If you already own a hybrid car: If you use your car for commuting to work or driving around town, a plug-in hybrid acts as an electric car all the time you are driving. How important is that? Well, let’s put it this way: I am an electric vehicle purist at heart, and to transform the automobile market, we need more electric and fewer gasoline-powered cars. You should convert your car simply because a plug-in hybrid electric car is one of the cleanest, most efficient, and most cost-effective forms of transportation around — and it is really fun to drive. Plug-in hybrid electric vehicles (PHEVs) combine the benefits of pure electric vehicles and those of hybrid electric vehicles. Like pure electric vehicles, they plug in to the electric grid and can be powered by the stored electricity alone. Like hybrid electric vehicles, they have engines that enable them to have a greater driving range and that can recharge the battery. The cost of the electricity needed to power plug-in hybrids for all-electric operation has been estimated at less than one-quarter of the cost of gasoline. Compared with conventional vehicles, PHEVs can reduce air pollution, dependence on petroleum, and the greenhouse gas emissions that contribute to global warming. Plug-in hybrids use no fossil fuel during their all-electric range if their batteries are charged from nuclear and renewable energy sources. Other benefits include improved national energy security, fewer fill-ups at the filling station, the convenience of recharging at home, opportunities to provide emergency backup power to the home, and vehicle-to-grid applications. Clean the Environment at the Same Time! 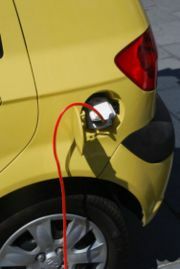 In July 2007, the Electric Power Research Institute (EPRI) and the National Resources Defense Council (NRDC) did one report that included multiple studies on plug-in hybrids. The report stated that scientists have confirmed that, unlike gasoline cars, plug-ins will get cleaner as they get older — because our power grid is getting cleaner. For people who are looking for the most effective way to end our addiction to oil, PHEVs make sense because carmakers can build them now, with today’s technology and using today’s infrastructure. The study showed that with the increase in the number of PHEVs on the road and the evolving characteristics of the power grid (in terms of capacity and carbon intensity), PHEVs will vastly reduce greenhouse gases over the next 40 years. The second study showed that increased PHEV use will reduce greenhouse gases over the next 20 years; even if, in the worst-case scenario, we still use lots of coal, nationwide air quality in terms of other emissions will also improve. Three more points: Both reports match up well with previous studies. They reinforce the Pacific National Lab’s January 2007 findings that we won’t have to build new power plants for cars that charge at night. And we’re gratified that General Motors recognizes this study as validation of its decision to evolve toward the electrification of transportation. California, New York, Massachusetts and some other states have had zero-emission-vehicle programs since the early 1990s, because battery electric vehicles in those states, taking into account power plants, are far cleaner than gasoline cars in reducing urban air pollution and smog. The issue keeps being raised, although studies are conclusive. Excerpt from Build Your Own Plug-in Hybrid Electric Vehicle by Seth Leitman, McGraw-Hill Professional, TAB Green Guru Guides Plug-in kits add an additional battery and charging unit to specific Hybrid car model. Plug-in conversion kits vary in their level of integration and features. Some plug-in kits simply extend the range of your hybrid when in EV mode (usually up to approx 45 kmph), other kits convert your hybrid to full electric vehicle capable of highway speeds under only electric power. Currently, the most popular Hybrid used for plug-in conversions is a Gen 2 Toyota Prius (2003-2009). A rich source of information about Plug-in Hybrid Electric Vehicles is the CalCars website. The California Cars Initiative (CalCars.org) is a Palo Alto-based nonprofit startup of entrepreneurs, engineers, environmentalists and consumers promoting 100+MPG plug-in hybrid electric vehicles (PHEVs). Also refer to Prius Gen 2 Plug-in page to witness a local PHEV journey unfolding. Electric car networks have been announced for Denmark, Israel, Australia and California's Bay Area by Pao Alto startup Better Place. These networks will include recharge points where cars are parked, and battery swap locations for longer range trips. Power and grid utilities companies are gearing up to tap into the stored energy that plug-in electric vehicles can provide using smart-grid technology. Car batteries can provide a buffer to lighten the load on the grid during peak times and potentially provide back-up power to home owners. In addition, old plug-in hybrid electric vehicle (PHEV) batteries could be recycled as storage devices. Blade Electric Vehicles - electric car conversions for new and used cars. The Green Vehicle Guide (GVG) - provides information about the environmental performance of new light vehicles (up to 3.5 tonnes gross vehicle mass) sold in Australia. The GVG can help you to choose a cleaner car. greenercars.org - is the official website for American Council for an energy Efficient Economy (ACEEE) Green Book which is a consumer resource providing Green Scores rating the environmental friendliness of every vehicle on United States market. Earth hour or peak hour?, The Sydney Morning Herald. 10 ideas to stop your car costing the earth. Autobloggreen - green car news and information. Most Economical Cars - Find out the most economical cars for each vehicle category from small cars to sports cars. These are the most fuel efficient cars you can buy. Hybrid Cars Compared - Compares the most important features of hybrid cars for each class of vehicle. Electric Cars Compared - Compares the key features of all electric cars for each class of vehicle. Electric Echo - How? - A manual on how to convert a Toyota Echo to an electric vehicle. The Green Living Guy - An expert in electric and plug-in hybrid electric vehicles. ↑ Affordable electric car to "hit streets in 2012"
This page was last modified 13:29, 27 April 2013. This page has been accessed 436,235 times.